Disclaimer: I have not bought dresses from their website and do not know the quality of the dresses or customer service. I am only showing photos of dresses on their website that I think are nice and how they inspire me for my nailart. All photos of dresses are found on their website. The page we are featuring today is Wedding Dress NZ - click HERE to visit the page! 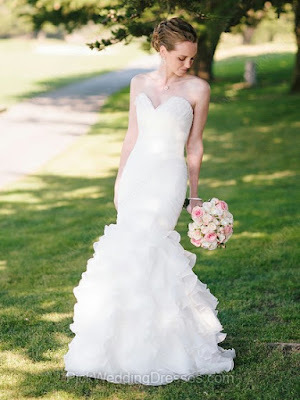 There are hundreds of wedding dresses to choose from and you can sort them by popularity or new arrival, etc. For this nailart, I was inspired by dress with tiers and layers of ruffles at the lower half of the body. These ruffles can be huge in a ball gown style or flowy layers in more of a relax wavy style. This one is such a cute and sweet dress with the short bottom cut. It can also be worn as a cocktail dress in other colors. On the ordering form, it lets you pick the color of the final dress you want so you can basically get all of these dresses for any other occasions! 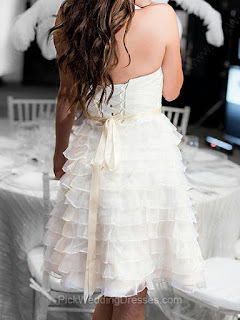 I really like this ruffled trumpet dress with sweet heart tube. I think this shape of dress accentuate the beautiful figure of the body. The overall look of this dress is very impressive for sure. But it looks like it might be a little hard to walk in this?! Haha. This wedding nail art was inspired by all the layers and tiers of the ruffle dresses. I think this style of dress is very romantic and yet it adds extra sweetness to the overall look. First I used a white polish and painted the French tips on. On my thumb and 3rd finger, I put strips of tape on the nail horizontally and painted over them. Then I put some silver glitter along the French tips and drew some lace pattern with a white nail striper to finish them. On the stripy nails, I used the same nail striper to add some diagonal lines at the empty space. This was my first time doing this style of nail art playing with negative (empty) space. I think it turned out OK and I will be experimenting with it more! Click HERE for a previous Wedding Dress X Nails blog posts!